LP Album Cover. 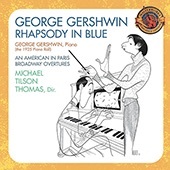 Rhapsody in Blue: the 1925 Piano Roll, Michael Tilson Thomas, Columbia Records, 1976. Manitou Messenger, Feb. 14, 1933. Is this negative reception of jazz a sign of the times at St. Olaf in the 1930s? It seems pretty forthright, which at first lead me to think there was room for anti-jazz, conservative thinking on campus at the time. However, in the publication later that month, another student wrote an opinion article which countered that the former article “was of very little consequence” and “hardly worthy of a serious reply.”6 This author claimed that this jazz band nay-sayer was fueling the fire that the college was attempting to paint itself as heavily religious. Manitou Messenger, Feb. 28, 1933. Interestingly, both authors simply signed their articles with their first initial leaving some room for anonymity. Although we don’t know who these students sharing their opinions were, what they were studying, or where they are now, we do know that responses to jazz were not all in loving favor. 1 Richard Crawford, America’s Musical Life: A History, (New York: W. W. Norton & Company, 2001), 573. 4 “Campus Opinion,” The Manitou Messenger No. 17, Vol. 46 (Northfield, MN), Feb. 1933. 6 “Campus Opinion,” The Manitou Messenger, No.19, Vol. 46 (Northfield, MN), Feb. 1933. This entry was posted in Jacob Noordermeer, Uncategorized and tagged Gershwin, jazz, Manitou Messenger, Rhapsody in Blue, St. Olaf, symphonic jazz by Jacob Noordermeer. Bookmark the permalink.